1 Paper, 2 Ways: Yellow Stripes — Gift Horse + Co.
About the paper: The yellow striped paper is actually burger basket liners that I picked up for sale last fall from Crate & Barrel. Unfortunately they're only 12" square, so it limits the size of gift one can wrap in it. 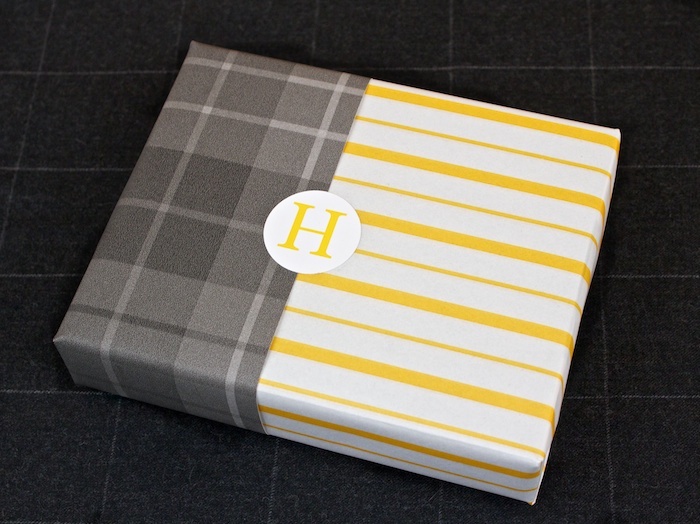 The grey plaid paper is a piece of Graham & Brown wallpaper; the pattern is Audrey in Charcoal. Wrap the box in the first paper. Cut the second paper to fit around 1/3–1/2 of the box, with enough to fold over the end. Make sure you have a straight line along the edge that will be on the front of the box. If you can't cut a straight line, fold the edge. Stick a piece of double-sided tape along the centre of your straight edge. Place your wrapped box facedown so 1/3–1/2 sits on the second paper. The tape will hold the paper in place on the front. Wrap the second paper as usual, around the one end of the box. For the monogram, type a letter in your choice of font into a word document on your computer, then print it onto card-stock. Cut out the letter (I used a 1 1/4" hole punch), and attach to the front of the gift using a glue stick.